When I heard that Kat Lee was turning her How They Blog interviews into a podcast, I knew it was time to start listening to podcasts instead of just hearing about them. But as my friends started talking about more podcasts they loved, I realized I needed a smarter way to listen to the latest episodes. Because, of course, anyone can go straight to the host site of any podcast and listen to the episode right there (or download it for listening later). You can often sign up to get email notification next time there’s a new episode (or even subscribe to the podcast’s RSS feed in a feed reader like Feedly). But the smart way to listen to podcast episodes is to use a podcasts app. Subscribe to your favorite podcasts once, and get notifications every time a new episode is downloaded and ready for you to listen to. It couldn’t be easier. The problem was not how to subscribe to podcasts on my Android tablet, but which of the many Android podcasts apps to choose. So I started searching for reviews, reading top ten app lists, and downloading the most promising ones to try them out myself. And as I tried app after app, I started noticing the feature trends and discovering the options I liked the most. P. Easy to find my favorite podcasts. I’m not a fan of typing in an RSS feed address to subscribe to a podcast. I want a powerful search feature that will enable me to quickly and easily find the podcasts I love. If I can’t find the podcasts I want, I won’t use the app, period. O. Custom categories or playlists. I listen to many different types of podcasts. I want to be able to choose to listen to specific topics depending on my mood or location. Customize-able categories or playlists are a must for my podcast app. D. Download podcasts automatically on wifi for offline listening. My tablet doesn’t have a cellular data package, and I have a lot of time offline on the road and at work when I could be listening to podcasts. I want simple and easy settings to control what podcasts are available offline. I don’t want to have to manually tap the download option on each episode–I want them to be automatically downloaded and ready for me to grab the tablet and go. Of course, my friends who have cellular data packages want to make sure that their phones or tablets don’t automatically download podcasts except on wifi or at specific locations. C. Quick access to unplayed podcasts. When I’m at home, I can browse through all the podcasts I subscribe to in order to find the latest episodes and choose exactly what I want to listen to. But when I’m on the road, I want one-touch access to the unplayed podcasts I subscribe to. So in addition to custom topical categories, I want it to be easy to find the playlist or filter that will provide me with all the podcasts I haven’t listened to yet. A. Per podcast speed, download, and archive settings. Whether your favorite podcaster talks so quickly you can’t understand them or enunciates so clearly it takes an age to get through the podcast, playback speed settings are a lifesaver. Just think of all the time you could save if you got through your unplayed podcasts at 1.2x speed! A truly custom podcasts app will allow you to set playback speed globally or for specific podcasts. While it’s great to have global settings such as “always download the latest episode of every podcast” and “save all unplayed” and “keep at maximum 10 episodes per podcast”, it’s really great to be able to customize those settings for each podcast. For example, I might want to keep every single episode I’ve ever heard of a how to podcast so I can listen to them in the future, whereas once I’ve heard a news podcast I won’t have a need to listen to it again. S. Show notes that are nice to view and easy to share. Great podcasts have great show notes. I like a podcast app that customizes the show notes display without losing the formatting. The ability to share the podcast straight from the show notes or episode is a plus! T. Access podcast player controls via lock screen and notifications, as well as widgets in Android devices. Widgets are one of my favorite Android features. I love being able to start or stop the podcast I’m in the middle of listening to right from the widget on my home screen. Lock screen controls are great, especially when you’re on the road. And notifications of new podcasts available for listening make access to my podcasts as easy as can be. S. Software, desktop app, or browser extension for a synchronized podcast experience on my laptop and tablet. My dream podcast app would offer me an account so I could synchronize my playlists and listening progress not only to my other devices, but to my computer as well. A browser extension featuring my favorite podcasts app would be the icing on the cake in podcasts apps. That way, I could tune into a podcast while working on the laptop just as easily as I do when I’m on the go with my tablet. P rating indicates that I was able to easily find multiple podcasts by typing in podcast name or keywords. O rating shows that there are some form of custom categories available with which to organize your podcast subscriptions. D rating signifies that there are automatic download options available with wifi-only configuration. C rating notes that there is some sort of unplayed playlist or filter available. A rating represents the fact that you can customize playback speed globally, as well as speed, download, and archive settings for specific podcasts. S rating means the show notes are easy to find with a nice display. T rated apps allow access to podcast controls via lock screen and notifications (as well as widgets in Android devices). 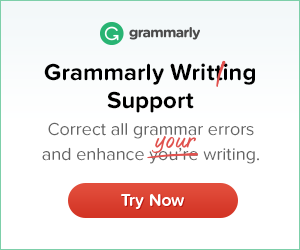 S rating notes additional methods of subscription synchronization via computer or browser extension. 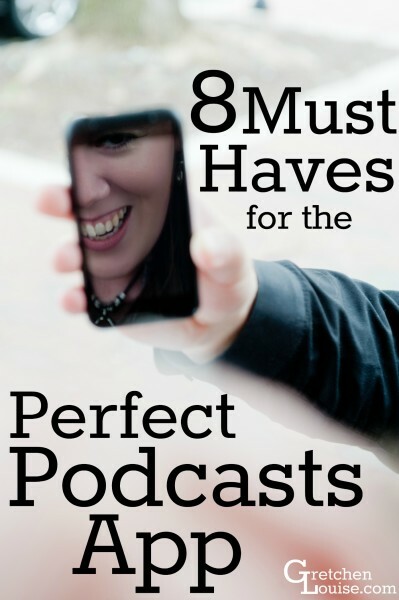 Now that you know what I consider must-haves for the perfect podcast app, here are the apps that came the closest to “perfect” in my book. I tested the Android apps on my Samsung Tablet, and recruited my friend Emily to help me out by trying the Apple apps on her iPhone. We tried all the apps so you don’t have to! The more I use Pocket Casts, the more I like it. 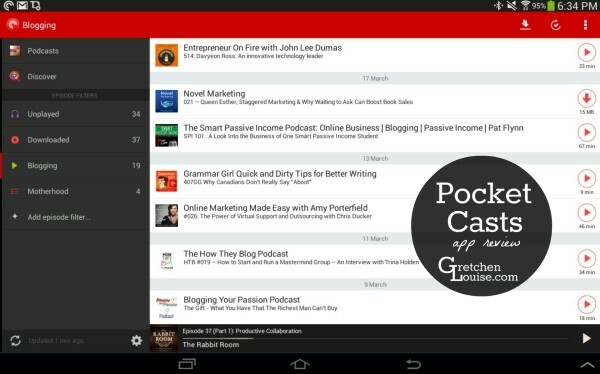 Pocket Casts cuts out the clutter and focuses on efficient playlists. It’s fast and clean while still providing a lot of custom options. You can easily skip annoying intros by choosing exactly how many seconds into the podcast to start playing, you can override global download/keep settings for individual podcasts, and it’s easy to click on the “unplayed” filter to get straight to what you need to listen to. There are one-click options for downloading all the podcasts in your view, playing them all, or marking them all as played. You can even speed up or slow down podcast playback for individual or all podcasts. That being said, since Pocket Casts brought out a web version, I’m a permanent fan. And for users of both Apple and Android products, Pocket Casts will be a no brainer. Being able to use the same app no matter the brand of device, and sync your playlists between them all, is a huge plus. (You do have to purchase Pocket Casts separately in both Google Play and the App store, but once you’ve made the purchase for each operating system, you can install it on any of your devices.) There’s no option to download a free trial of Pocket Casts, but at the price of just one cup of coffee, it’s hard to beat. I love a lot of things about this app. And not just because it’s logo is a coffee mug with head phones around it. Beautiful interface, simple search, easy to subscribe and categorize podcasts, a beautiful widget for your home screen. Press and hold on a podcast to access all options for the podcast–category, how many episodes to download and keep, custom playback speed, etc. With a multitude of settings available, you can backup and restore your subscriptions, change sort orders and cleanup old downloads. You can even sync with Feedly for easier subscription management. When viewing “All Feeds” or a specific category, a number displays by each podcast in the sidebar to show you how many new episodes are available. Click the number in the bottom right corner to reorder the automatic playlist of unfinished episodes. My only complaint about BeyondPod is that it often seemed slow, perhaps simply because of the number of options. I loved the simple, easy to navigate interface. Downcast has a powerful search function that has multiple layers of information. You can search top podcasts by category or add podcasts manually. Click on a podcast that piques your interest for the complete description then view a list of episodes. The information icon has an even more detailed description of that particular episode. Each episode is available to download, mark for streaming, or stream immediately. Even with limited terms, I was always able to find what I was looking for via search. Setting features: automatic feed refreshing can be set to wifi only (helpful for my limited data plan), on a schedule (ranging from every 0-24 hours) or at a specific location. 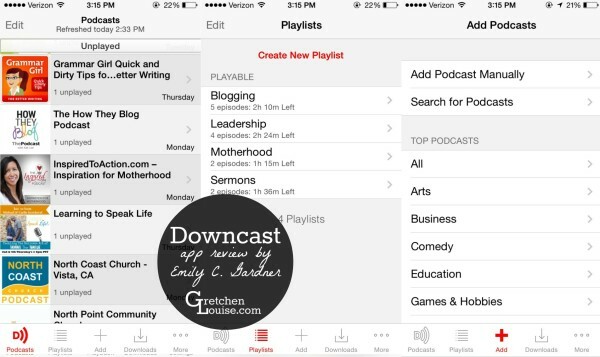 Downcast allows you to select between streaming, downloading, or manually choosing new episodes. I made several playlists within minutes of subscribing to all of my favorites. There are a host of sharing options accessed via the individual episode screen. Users can take actions like copy, email, open in web browser, or utilize almost every social media service to share. The downside to Downcast is the $10 price tag for the app on your Mac computer. If you are a mobile or tablet podcast listener, Downcast is far superior to Apple’s podcast app. Instacast 4 has a detailed directory of podcasts, but it’s not as simple to navigate as Downcast. You can search by Title, Author, or Description as well as Popular, Authors, and Genres from a bottom navigation bar. 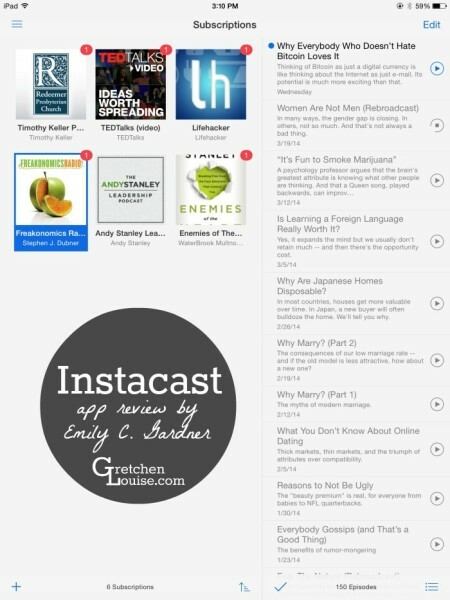 Instacast provides a “Lists” feature, enabling users to store podcasts in one of four pre-made lists (imported, unplayed, downloaded, and favorites) or a user-created list. “Smart Lists” follow rules set by the user like all partially played podcasts go into a Need To Finish list. The top page of Instacast automatically displays unplayed podcasts so you can see what you have waiting with one glance. There’s a Send as Email option for each episode as well as a Read Later option for episodes that have notes. Sharing is limited to Twitter. Like Downcast, Instacast is available for purchase on Mac, and when an account is created, all podcasts and settings will sync between iOS devices and a Mac desktop or laptop. The downside to Instacast is the price. The app for a phone or tablet is $3.99, but to sync with the app on a Mac computer, a separate app has to be purchased for $20. Instacast would be a good option if syncing between an iOS device and a Mac computer is a must. However, Downcast has a more streamlined, user-friendly approach. RSSRadio7 is the perfect option for a beginning podcaster. When the app is opened for the first time, users are shown a welcome screen with a brief description of the simplest way to get started. Before RSSRadio7 lets you browse any podcasts, users are shown a handy annotated image of the app’s features, which are mostly intuitive. Downloads button not only shows you any downloads in process, it also gives a storage report so users know when they need to start deleting podcasts. The setting tab has a short list of global settings to adjust. Default Subscription Settings will take uses to a more detailed list of options for streaming, archiving, and playback functions. I loved the ability to create custom gestures (tap the podcast icon to play or pause, etc) under “Now Playing” settings. Once users are subscribed to a podcast they can manually adjust sepcific settings for each one. Notes and sharing options are available for individual podcasts. You can also sync to iCloud or Dropbox and set up a backup so saved podcasts aren’t lost. Despite the ads, the interface of RSSRadio7 is clean and easy to navigate. I prefer it to Apple Podcasts because of its handy helps and support. One of the best things about Podcasts app is the price: free. For an Apple product, this app isn’t the most intuitive, though it does have good features. Stations function like lists/playlists in other apps. I loved the On-The-Go station, a special playlist for playing just the episodes you select. Settings are not universal. Users must adjust settings for each subscription. This is time consuming but the customization is nice. Sharing is limited to text, email, Twitter, and Facebook. Two major downsides: 1. No access to episode notes. 2. No wifi only configuration. Synchronization is easy through iTunes, but your phone needs to be plugged in to sync to a computer. If you are recreational podcast listener, this is a great option. If you’re concerned about using cellular data, turn the Refresh Podcast option to manual in settings for each subscription. I first started searching for podcasts on my phone through the Windows Store. It was easy to search podcasts there by genre, top rated, top free, etc. and though not all podcasts showed up in search results, it was very easy to subscribe to the podcasts I found. To access my new podcast subscriptions I had to go through the “Music + Videos” link on my phone, and from there I could choose specific podcasts to “pin to start”. After some tinkering around with the PODCASTS! app, I was disappointed to find that it only houses your podcast subscriptions, instead of all music and video on your phone like the “Music + Videos” Hub. And in my opinion, the search function on the PODCASTS! app is actually harder to use than in the Windows Store. PODCASTS! allows you to listen to the podcast while still using your phone as a phone, with the ability to pause, fast-forward, and rewind, as well as adjust the speed of playback. You can view subscriptions and recent episodes from the app’s home screen, but there is no way to customize a specific podcast’s settings, and the app is generally lacking in features, despite its popularity. Overall, in my infantile experience with podcasts and podcast apps, my advice for any Windows Phone users would be to stick with the apps that are already programmed into your phone. No downloading or payments necessary, Windows Phones allow you to listen and manage your podcast subscriptions with ease. Reminiscent of Stitcher, SlapDash is a selective catalog of podcasts. You can easily sync across devices via the Cloud or a Facebook login. Unlike Stitcher, however, you can manually add the URL to any podcasts you can’t find in the catalog. There is no access to show notes, nor is there the ability to create any kind of custom categories or playlists. And there is absolutely no manual control. Podcast Bandit left a lot to be desired, with virtually no search results (you can add podcasts manually, however). Automatic download settings and a customized playlist (add episodes to your playlist without subscribing to the podcast itself) are its only features worth speaking of. Don’t bother paying to buy it. I read dozens of Android podcast app reviews and tried countless more free apps in the Google Play store. If you’re not convinced that you want to pay for the perfect app, you can read my reviews below to find out which free apps are even worth checking out. Here are quick thoughts and a rating for each of the additional apps I tried (listed in alphabetical order). Tip: If you’re an Android user, install the Google Opinion Rewards to get Google Play credit in exchange for answering occasional surveys! My credits have paid for the apps I’ve tried so far. Ugly interface, clunky controls, impossible to find any podcasts, this app did not win any awards with me. There did not appear to be many options available, either. Supposedly a great interface, but without a search feature that enables me to find podcasts I want to listen to, why would I use it? There do appear to be some nice options, and to be fair, the app says it is still in beta. A super simple app, without a lot of options (at least in the free version). But it does what it needs to do: it plays podcasts. I wanted to like this app. It’s free, it has a car mode with easy swipe controls. But I found it to be the most confusing and buggy interface. The icons were confusing–it took me forever just to figure out how to subscribe to a podcast! It displays only a slice of the show logo, and I couldn’t find any way to view show notes. It does have a nice widget. Price: free; $1.99 for no-ad license. This app has a nice interface, with great social sharing potential, but I couldn’t find any apps I was looking for, and there was no way to manually subscribe. The most annoying thing about it was the lack of automatic screen rotation on my Android tablet, even though it had some nice widget options. A strange app that automatically subscribes you to any podcast you view, it’s features are very simplistic, but at least the search function works! An annoying attribute is the fact that it does not auto-rotate the screen view on my Android tablet. Podcast Addict has some nice features, though I felt the interface lacking. You can speed up your player in order to listen to more podcasts in less time. View show notes, share a direct link to the podcast from the player, add a widget to your home screen, use the sleep timer, and easily switch to car mode. Podcast Addict assigns your subscriptions to default categories automatically, allowing you to override them with your own custom topical categories. With nice widget options (though a lack of lock screen controls), this app is definitely worth considering if you’re willing to learn its difficult interface in exchange for the free price tag. Price: free; donate to remove ads. Podkicker Pro is a complete rework of the free (and completely worthless) Podkicker Podcast Player. It’s not my favorite interface, but it does works. 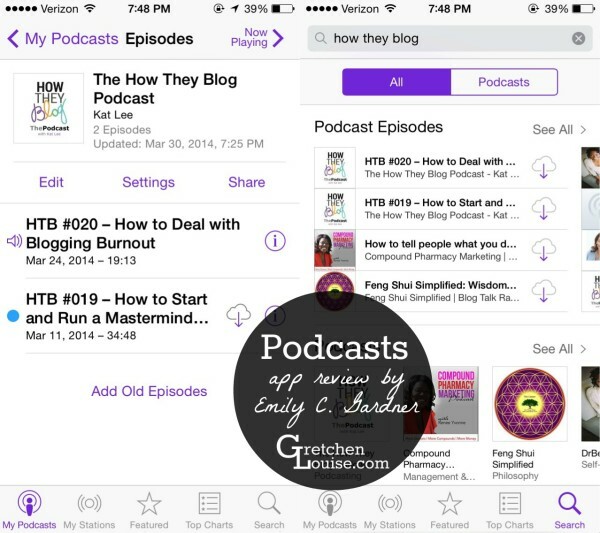 You can view podcasts by category/tag, use a sleep timer, require battery and/or wifi for downloads, show space left on device, even automatically resume after a phone call or an audio jack is plugged back in. I would opt to spend a few more dollars and get Pocket Casts, but Podkicker Pro definitely has good features for the price. I downloaded the free trial for this app and was shocked at the lack of features and the complete inability to find a single podcast. There weren’t even any podcasts in the “Top podcasts” or “Browse podcasts” options. This app is also apparently designed for phones as the view was very blurry on my tablet. Please don’t bother downloading the trial, and definitely don’t shell out $6.99 for this app. An extremely simple interface, this app is the bare minimum in podcast support. I was able to find podcasts, but had subscription errors on some, and others took a long time to gather information about the podcast. You can specify how many new files to download from each podcast, and how often to refresh subscriptions. What podcast app do you use? Please comment and share your own review! I’m a bit late to the party, but I wanted to thank you for the extensive post. 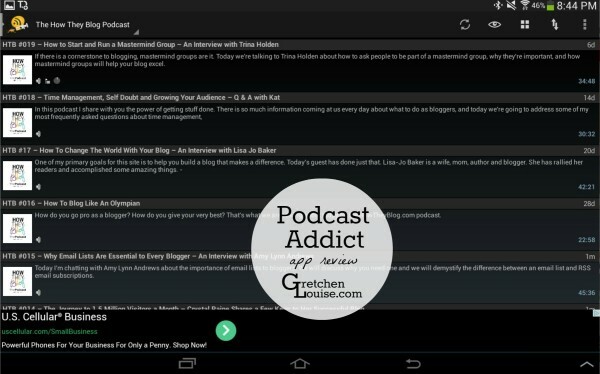 I’ve been using Podcast Addict out of habit for a good while. I’ve always found the UI really confusing but just never bothered to wade through all the alternatives to find a better app. Based on your review I purchased Pocket Casts and I really like it (this is coming from someone who has ever paid for probably 5 Android apps). I don’t use all of its features so I can’t comment on how well they all work, but it’s been super-fast and intuitive to use, and I listen to more podcasts than before because now it’s a lot more convenient. Maybe I’m just greedy but I would like to find an podcast player app that not only allows me to make my own “smart playlists” but also allows me to create Tags for episodes for quicker referencing. Anyone? Quick comment on Doggcatcher. Been using the app for years and search has improved dramatically. Presume his article was written a while ago? Have you done a more recent review? Or when was this done? My favourite app just moved to Acast only as far as I can tell. Not happy about that. Hello Stian, thanks for the comment about Doggcatcher. You’re right, it has been drastically improved! I purchased the app (free trial no longer available) and was able to easily search and subscribe to any number of my favorite podcasts. I still prefer the features and layout of Pocket Casts, but Doggcatcher appears to be a viable and more budget-friendly option now. Thank you! Alas, on-the-go in the apple Podcasts app is gone. I like the way you rate the apps very much. Great work! By the way, have you looked into “Podcast Republic”? According to my Google Play account, I have downloaded/tried Podcast Republic. But I don’t remember it specifically. I’ll have to give it another look. The reason I mention it is because it has quite high downloads, include it would make you review more complete. BTW: Your rating has 2 Ss, when an app gets only 1 S, which S would it be? :-) Too picky eh. Love this! Thank you. 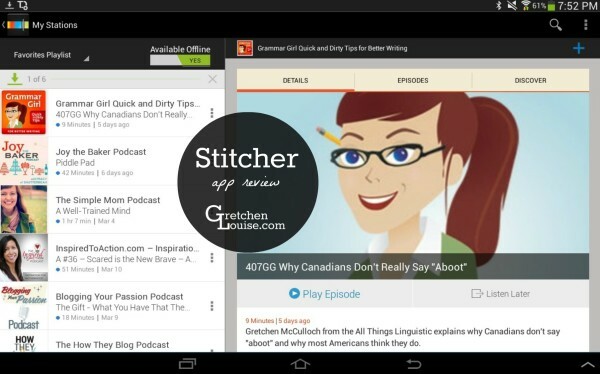 I love stitcher but it too doesn’t have all my podcasts! So if you were going to spend $ on only one app would you pick beyondpod or pocket cast? 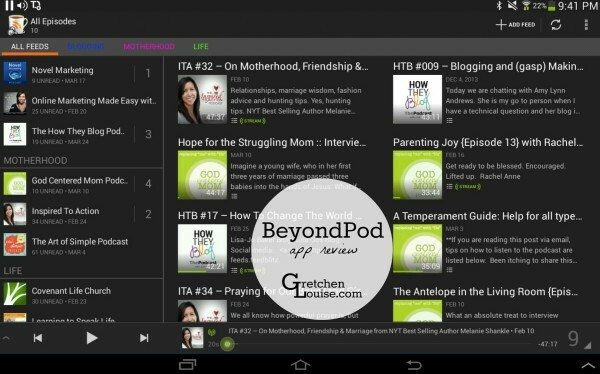 I’m trying out the free version of beyondpod but since pocket cast doesn’t have a trial I can’t compare the two. Loved this post! Awesome. Thanks! 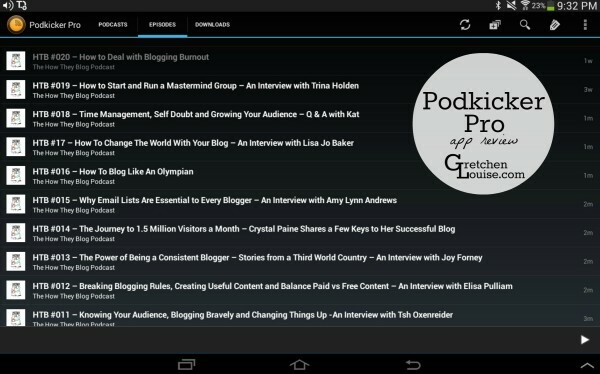 I don’t love BeyondPod so I’m going to try Pocket Cast! Thanks! I’ll look forward to hearing how you like it! Hey thanks for trying out all these apps and reporting back like this. I’d also gone though many podcast apps and not found one I really liked but your guide helped me find Pocket Casts which is pretty much perfect. You’re welcome! Glad it helped. I, too, think Pocket Casts is pretty much perfect. It is all over the place. So after each podcast you have to manually go in and pick the next podcast if you want to hear them in sequence. They have a sort feature but it doesn’t follow any logical pattern I am familiar with. I will pay Podcast Republic to fix the problem. I already paid for Pocket Cast and cannot use it. Anyway, why is it so hard for them to get this figured out. Downcast searches podcast subscriptions nicely, but it has no ability to search episodes of podcasts after subscription. I consider that “weak search” compared to other apps. That’s a valid point, however, I rated all the apps I reviewed on their ability to search for specific podcasts, not episodes. I searched for the same few podcasts (which were in different genres) on all the apps. Downcast found all of them, even when I didn’t have the title quite right or searched via podcast host. Not every app had such great results. So, to be consistent, based on looking for podcasts, I think Downcast does have a strong search function. Is there an app you particularly like that has the ability to search for specific episodes? 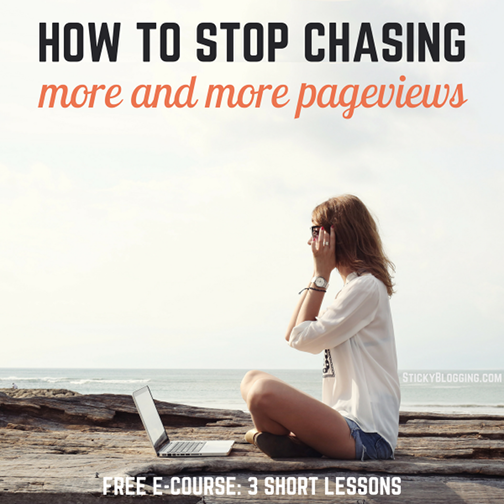 This is such a great, comprehensive post! Thanks so much for sharing all the details on which apps to spend money on. I’m so excited to finally download one! 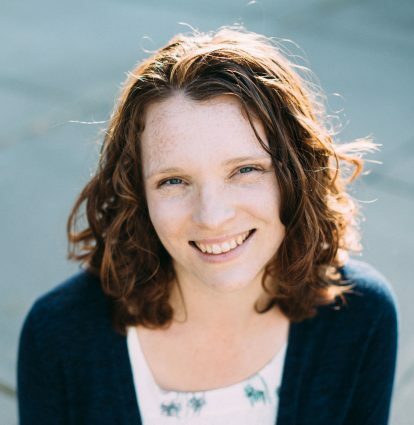 Thank you for all your encouragement as I worked on the post, Kalyn! I’ll look forward to hearing which app you end up with.